The Zoom Technology in the midsole may have worked as intended because many users say that the shoe is responsive and comfortable. A huge number of buyers get a second pair of these LeBron shoes because of the support, fit, and comfort that they offer. A large number of wearers agree that the look and numerous colorways of the Nike Lebron Zoom Witness are stylish. The rubber outsole grips courts well, say a good number of reviewers. Most users are happy that these Nike shoes do not need any break-in time. They can be used straight out of the box with no issues. Athletes with wider feet are thankful to Nike for creating a LeBron model that fits them well. The Achilles pad is loved by many buyers because it provides additional comfort and support to the ankle. The 6th Air Jordan shoes also make use of these comfortable pads. Some reviewers claim that the pliable outsole easily wears out when used outdoors. People with narrow to normal feet say there that there is a lot of dead space in the toe area when they go true to size. The outsole attracts too much dust that it needs to be wiped frequently, several wearers say. Some users mention that the mesh upper starts to rip after just a few games. At only $100, and given its minimal cushioning setup, who would think that the Nike LeBron Witness will be a great performance shoe? The materials that compose these Nike basketball shoes may be light, but they certainly are no less supportive than the heavier ones. The LeBron Zoom Witness can accommodate any playing style. Grab this good-looking shoe now and discover its superb on-court attributes. I didn't have a lot of expectations with this shoe and this shoe didn't meet my expectations, either... So it was pretty bad. Comfortable, horrible cushion, solid traction, weak support and a very light upper. The Nike LeBron Zoom Witness was released on October 2016 as a budget performance model. It has an extra internal pad, which has a unique design and provides more support to the ankle. The midsole has the combination of Zoom technology and Phylon, delivering responsiveness to the shoe. The outsole has a hexagonal diamond traction pattern to achieve a good court grip. Wearers can expect these affordable Nike kicks to get the job done, though it is still not as great as the famous LeBron 16. The Zoom Witness is for casual hooping, whereas the 16th LBJ is a tank for rigorous playing. Cushion. The responsiveness of the Zoom Witness comes from the Zoom Technology embedded in the midsole, which is made mostly of Phylon. The two Zoom pads provide significant energy returns upon landing. The technology is going to be useful for guard players who use the forefoot more often. The heel part of the outsole is also rounded to provide a smooth heel-to-toe transition. Traction. The Nike LeBron Zoom Witness has a hexagonal diamond traction pattern. It has a great grip on both indoor and outdoor courts. But because the rubber is thick and pliable, the shoe model is considered a decent outdoor option. Length and Width. The other LeBron releases come in standard widths and lengths. The Zoom Witness, however, is designed for people with wider feet. There is more than enough space in the toe box for the toes to flex. Buyers with narrow to normal feet are advised to go down half a size. To make sure the shoe fits them well, another option would be to have the try it on in local stores nearby. Lockdown. The Nike LeBron Zoom Witness uses a traditional lace-up system with oval shoelaces. The shoelaces and the tongue can be tightened to achieve the desired fit. To provide additional support and lockdown to the foot, Nike placed a half-length inner sleeve and an Achilles heel pad inside the shoe. The upper of the LeBron Zoom Witness is composed of mesh, and it ha a rear panel with Phylon. To add durability to the mesh, there is a light fuse underlay beneath it. This setup also helps maintain air flow to the foot. The white Phylon overlay serves as an external support to the heel counter. It extends from the medial to the lateral side of the shoe to keep the foot in place. 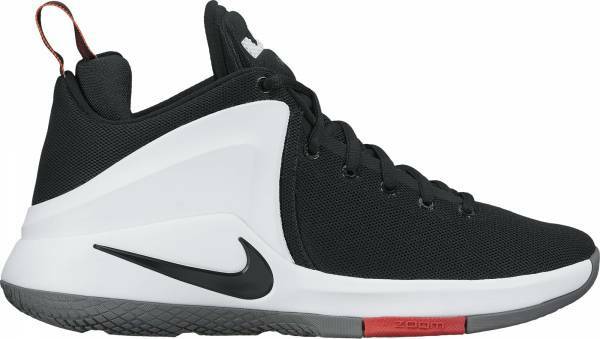 The Nike LeBron Zoom Witness is a mid-top shoe that comes in different colorways. The prestigious Nike Swoosh is located on the forefoot and lateral side of the shoe. To show that this shoe is part of the LeBron signature series, his logos are displayed on the tongue, outsole, and insole. There is a sturdy and dainty pull tab that is connected to the Achilles pad and heel counter. It aids the user in getting in and out of the shoe. To showcase the technology used in the midsole, there is a NIKE ZOOM callout printed on the lower lateral side of the shoe.